While several days ago, the candidate of Fuerza Popular (Popular Force), Keiko Fujimori, signed a controversial agreement with the representatives of the small illegal and informal mining industry, the other candidate, Pedro Pablo Kuczynski (PPK) of Peruanos por el Kambio (Peruvians for Change), tried to brush over the fact that before the campaign, he had suggested the removal of the Minister for the Environment. Mongabay Latam talked with the spokespeople of both parties, as well as with environmental specialists in order to prepare this special report. Peru is known worldwide for its vast cultural richness and biological diversity: it ranks in the top six most biodiverse countries, according to a list Mongabay presented a few days ago. However, it is also known for its violent conflicts related to the extraction and exploitation of natural resources. These conflicts suggest the state is having a difficult time navigating environmental protection while also pursuing economic development. Faced with this scenario, is the environment among the priorities of the presidential candidates? Mongabay Latam talked with the environmental spokespeople of the parties competing for presidency. The representative of Fuerza Popular is Juan Carlos Ramírez, a mining engineer and ex-Vice-President to Alberto Fujimori, the father of the candidate Keiko Fujimori and who is today imprisoned on charges of corruption. The representative of Peruanos por el Kambio is environmental consultant and specialist for the United Nations Environment Programme, César Ipenza. According to the latest report from the Office of the Ombudsman, there are currently 209 social conflicts – 145 active, 64 dormant. Of these, nearly 70% are of a socio-environmental nature and are focused in the mining and gas extraction areas of the Ancash, Puno, Cusco and Apurimac regions. This situation has forced the two candidates to propose various mechanisms which will allow the state to intervene effectively in the conflicts. Fuerza Popular has announced that it will name a High Commissioner who will bring together the interests of private businesses, civil society and the State. But what will happen in hot zones where the conflicts have caused deaths? Ramírez, of Fuerza Popular, maintains that a Mining Forest Programme will be implemented, in which both the topics of forestry and mining will be developed. PPK (Peruanos por el Kambio) and Keiko Fujimori debate the presidency of Peru this Sunday the 5th of June. (Photo credit: La República). “All of the mines have to reserve a portion of their income so that they can close the mine appropriately, which compensates for any potential impacts on the environment that it had while in operation. This amounts to hundreds of millions of dollars which mining companies have to either invest or pay to the Peruvian State for these purposes and are currently in the form of letters of guarantee…,” is the Programme description found in the government plan of the Fuerza Popular. During the first presidential debate last Sunday between the PPK and Keiko Fujimori, the latter explained that “Water will be firstly for human consumption, agriculture and animal husbandry, then for other production activities”. A significant campaign promise, given that it was the people of Cajamarca’s concern about water which, through a series of social protests, stopped investment in the Conga Mining Project, valued at more than 4.8 million dollars. Protesters against the Conga Mining Project gather around El Perol lagoon in the Cajamarca region. (Photo credits: Fabiola Valle). In the other corner, the spokesperson for Kuckzynski believes that if there is sufficient civilian participation, the environmental conflicts can be solved. “Every project is perfectly viable, provided that it complies with the demands of the state and the citizen participation mechanism which the Law demands,” said Ipenza. In order to prevent future cases of social conflict, the PPK will implement a new system called Adelantado Social [Social Advancement], which will promote the installation of better social and living conditions (schools, hospitals and basic services) for the populations who live in areas affected by extraction projects. “If a project has not even been started, we cannot say if it will have an impact. We will also consolidate the role of the National Certification Service for Sustainable Investments (SENACE) for the valuation of the Environmental Impact Study and we will carry out a comprehensive evaluation of the ‘One-stop-shop’ system,” Ipenza explained to Mongabay. For José de Echave, an expert in social unrest and ex-Vice-Minister of Environmental Management for the current government, none of the government plans go to the root of the issue. Echave is worried by the statements of Keiko Fujimori, who would use the armed forces for civilian security. As has already been seen in confrontations between citizens and the police, the armed forces could be used in scenarios of socio-environmental unrest. “We cannot say that the government plans are the same because if I see that one candidate is saying that they are going to put the armed forces in the street to protect ‘civilian security’, which demonstrates an unusual strategy for managing socio-environmental conflicts, then this scenario worries me even more”. According the Office of the Ombudsman, in the majority of socio-environmental conflicts the main demand of the indigenous people is that prior consultation process be carried out in such a way that the Peruvian State can take their opinions into consideration before the development of extractive projects. The lack of land titling of lands where indigenous peoples live is also a serious problem in Peru. According to the Interethnic Association for Development of the Peruvian Jungle (AIDESEP), before 2014, 1166 communities in the whole of the Amazon had registered as needing recognition and land titling for more than 8 million hectares of land. “Our agreement is to consolidate the mechanism for prior consultation, but Convention 169 also notes other rights which are not being fulfilled, such as Intercultural Bilingual Education. Moreover, we will ensure the participation of the indigenous peoples in the vice-Ministry of Interculturalism,” responded César Ipenza. With respect to land titling of territories, Ipenza said, “We will continue to provide the best legal protection to native communities, but with a sense of a collective territory, which is what the indigenous peoples are demanding. However, each case has to be viewed individually because of the colonists’ invasions”. Nevertheless, the forestry director at the Peruvian Society of Environmental Law (SPDA), José Luis Capella, indicates that even if giving indigenous populations a right which belongs to them, such as land titling, is the right thing to do, it has to be done in an ordered way. Other aspects, such as not giving lands to migrants whose cultivations affect the forests, also have to be taken into consideration. “In Keiko Fujimori’s case, her plan is more centred on granting land rights to native communities, but it promotes awarding full ownership. Peru has just received money from Norway in order to entitle communities. Its goal is only 86 in the next 18 months, which is more realistic,” maintains the specialist. For Capella, the main danger of granting land rights to everyone is that the priority becomes meeting numerical goals and not necessarily maintaining the traditional uses of the community. “In the end, rights are not given to those who are owed them; they only want to deliver a total figure of millions of hectares handed over. This also affects the conservation of the Amazon. Land titling in the government plans has to be linked to the giving of rights for sustainable use of the forest, rather than deforestation,” he explained to Mongabay. 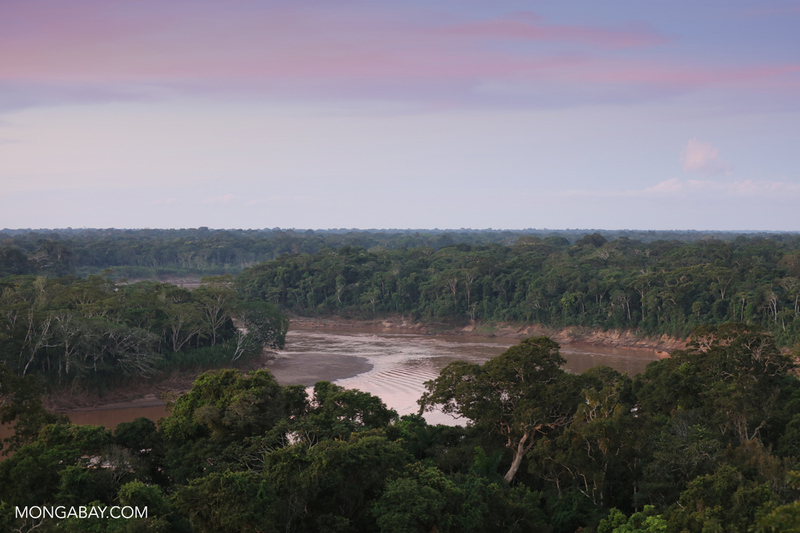 Despite 15% of the country consisting of protected areas, there is a lack of public investment in Peru to protect these areas from extractive activities. “The main cause of deforestation is the advancement of the agricultural frontier through little pieces of land, averaging five hectares, in the Amazon. Neither candidate has broached this topic,” states SPDA‘s Capella. Even though both parties concur that the state will preserve the natural protected areas, the ex –Vice-minister, José De Echave, states that there is very little said of this in the government plans. “Generally speaking, both programmes are quite weak in the matter of natural protected areas; there are various components which should be included in an environmental policy and they are not there,” maintains the ex-Vice-minister. In fact, neither spokesperson gave a satisfying response as to the position of their party on the proposal of the National Service of Areas Protected by the State (SERNANP) to create two new protected zones: the Tropical Pacific Seas reserve, located between the Piura and Tumbes regions, and the Yahuas Reserved Zone (Yaguas Reserved Zone) in the Loreto region. A sea turtle which lives off the coast of Peru. (Photo credit: SERNANP). According to the latest figures given by the government, more than 170,000 hectares of forests in Peru were cut down in 2014, an area more than 15 times the total area of the island of Cuba. It also confirmed that every year, Peru loses between 120,000 and 130,000 hectares of forest; 2014 saw the highest figure of the last 10 years. “We have an agreement to grow the Forest Conservation Project. We want to increase the number of communities affiliated with this programme, which will offer payment for a well cared-for hectare of forest,” stated Ipenza, of PPK. “PPK deals with the topic of changing land use and climate changes because they want to arrive in 2021 with zero net deforestation, continue with the Forest Conservation Programme and make the most of the resources resulting from climate change. As for Keiko Fujimori, her plan is more centred on granting land rights to native communities, but she promises to grant full ownership before 2021. I do not know how she will do it; to me, it seems a populist measure,” said the SPDA forestry specialist. The parties’ specialists have also taken a stance concerning the constant petrol spills in the Chiriaco and Morona communities, and the fissures in the gas pipeline in southern Peru caused by the Camisea project. “If it is a public business, we have to place appropriate people. If I have a serious and consolidated regulatory agency which has the resources for it, I will be able to supervise,” said Ipenza. Moreover, he denied that the Ministry of the Environment was going to merge with the Ministry of Energy and Mines, as the PPK candidate had originally claimed. “There will be no fusion, we will strengthen the Ministry of the Environment,” he responded. “The protected areas are those which have to be protected, such as natural parks and reserves, followed by other areas and those which are seriously contaminated with mercury,” said Ramírez. As for Keiko Fujimori, during the first presidential debate about sanctions for private or state business contaminating the environment, she warned that sanctions would range “From a severe fine to the cancellation of tender; the fine will be used to compensate the affected population”. Rapid growth of Illegal mining was the only topic that landed the environment in the spotlight during the campaign. According to a report from the Amazon Conservation Association (ACA) and the Asociación para la Conservación de la Cuenca Amazónica [Association for the Conservation of the Amazonian Mining Area] (ACCA), between 2013 and 2015, more than 2,500 hectares of forest were cut down near the Tambopata National Reserve in Madre de Dios alone. The illegal and informal mining industry has already cut down more than 2500 hectares of forest in Madre de Dios and contaminated the rivers with mercury. (Photo credit: SPDA). The attention was focused even more on Fujimori, as a week ago she signed an agreement with the informal and illegal miners. The agreement revoked decrees that regulate informal and illegal mining and set guidelines for full legalization. The spokesperson of Fuerza Popular says this group of legislative decrees “are very bad” in environmental terms and plans to revoke them to make way for an efficient team who will resolve the issue. In response, Ipenza stated that they are not going to revoke these decrees. Rather, they will promote the creation of a mixed-nature “Mining Promotion Bank” in order to offer credit to the miners who want to become legitimate under the law. In the presidential debate, Pedro Pablo Kuczynski held his position, trying to mark the difference between himself and the Fuerza Popular candidate, “We have to protect our Amazon, if we support these things, we will be in trouble”. “I feel there is more risk with Fuerza Popular as their political orientation means more pressure on the conservation areas,” stated Capella. “Their candidate has just signed an agreement with illegal miners and promised them that she is will eliminate a normative [practice], which will not have achieved the results we wanted. This is the first step in differentiating between informal from illegal, clarifying what is illegal, and measuring the impact on the Amazon”. In a past statement, the candidate Keiko Fujimori insisted that the Fuerza Popular “Peru Plan” is clear and there is no room for improvement”. De Echave believes that if revising the plans is important, then considering the political conduct of each candidate is also important. “More than focusing on what the government plans do or do not say, it is the profile of the political figures of each plan which should draw our attention. Both consider prior consultancy a hindrance; the coming situation is quite complicated.” In other words, neither candidate seems to value the expertise of civil society groups focused on environmental issues. “The problem is that at the same time as saying that they are going to invest in the areas protected by the State, they contradict themselves because they are promoting activities which affect these areas. For example, Fuerza Popular has signed agreements with illegal and informal miners in the Tambopata National Reserve,” said SPDA’s Capella. The PPK’s environmental plan is found in “Proposals for a Country with a Better Welfare State” block of the first part of their plan, with the environmental protection section on pages 114 to 129. The environment is discussed in the sixth block of Fuerza Popular’s plan: “Natural Resources and the Environment,” on pages 54 to 70.